Exhibition view: Moon Kyungwon and Jeon Joonho, 《News From Nowhere》, Tate Liverpool (23 November 2018–17 March 2019), ©Tate. Photo: Oliver Cowling. From around 2007, South Korean artists Moon Kyungwon and Jeon Joonho found that they were increasingly selected to participate in group shows alongside each other. As such, they regularly shared time and space, either in gallery installs or on journeys to or from them. On these and other occasions, they often found themselves chatting about their work—within the context of those exhibitions—and a healthy critical dialogue developed. Out of that sprang deeper conversations on the value of the contemporary art world they each inhabited and operated in, and the implications of—as they saw it—the oft-disposable nature of the artwork and, in turn, the very role of art and artists. 'At that time, we were already fed up, feeling irritated about wasteful exhibitions and art production', they said in an April 2015 conversation. 'We desperately wanted to find the reason why artists should exist and discover some hopeful potential from among the meaningless art.' Out of this desire, 《News From Nowhere》 was born, the umbrella name for a collaborative project that comprises films, installations, workshops, lectures, and a website. It takes its name from the 1890 novel by artist, designer, and socialist pioneer William Morris, in which Morris' protagonist—having fallen asleep—wakes to find himself in a 21st century world very different from his own. This passage of time is used by Morris as a device to comment on the inequalities he observed in his own society—one increasingly industrialised and driven by capitalism. Moon Kyungwon and Jeon Joonho, 〈El Fin del Mundo (The End of the World)〉 (2012). Two-channel HD video installation with sound, 13 min 35 sec. ©the artists and Gallery Hyundai. Having initiated their project formally in 2009, the passage of time as a means to interrogate the present is a central theme and focus for Moon and Jeon. Central to the works that comprise 《News From Nowhere》 is 〈El Fin del Mundo(The End of the World)〉 (2012): a two-channel, 13-minute HD video installation that bears all the hallmarks of classic post-apocalyptic and dystopian science fiction. On one screen in the 'past' (in the context of the film's narrative), a man is depicted toiling diligently, collecting found materials to use in his artworks, even as society is crashing headlong to its end. In juxtaposition, a woman dressed in a futuristic and pristine hazmat suit, collects and analyses samples collected long after the catastrophe has unfolded. Each character, separated by time and societal collapse, occupies the same geographical space, and handles the same materials; through the man's endeavours and commitment to art, each of them experiences a sensation something akin to an epiphany. The film seems to suggest that the future, contingent on what we do in the present, remains unwritten, and that our lives, and the lives of those around us, can be imbued with great meaning through art. 〈El Fin del Mundo〉 is presented at Tate Liverpool as part of the artists' first museum exhibition in the UK (2018.11.23.–2019.3.17.). 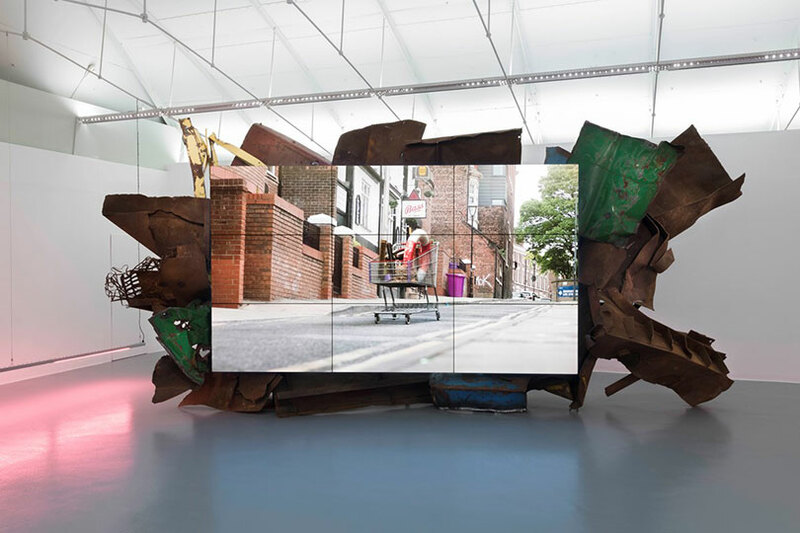 It is shown alongside two new commissions (both 2018): 〈Anomaly Strolls〉, a two-part film whose screens are supported by scrap metal sculptures, and 〈My Future Will Reflect a New World〉, which includes a manhole cover presented inside the gallery, and another installed at the Tate Liverpool's entrance. The latter work's title decorates each cover's surface—a form the artists consider representative of the façade that often conceals what lurks behind civilisation's veneer. They are the final words of the female protagonist in 〈El Fin del Mundo〉, as she poignantly asserts that her life from this moment of transcendence might be different. Moon Kyungwon and Jeon Joonho, 〈My Future Will Reflect a New World〉 (2018). Cast iron, 66.5 x 66.5 x 5.8 (h) cm. Exhibition view: Moon Kyungwon and Jeon Joonho, 《News From Nowhere》, Tate Liverpool (23 November 2018–17 March 2019). ©the artists and Gallery Hyundai. Photo: Moon Kyungwon and Jeon Joonho. 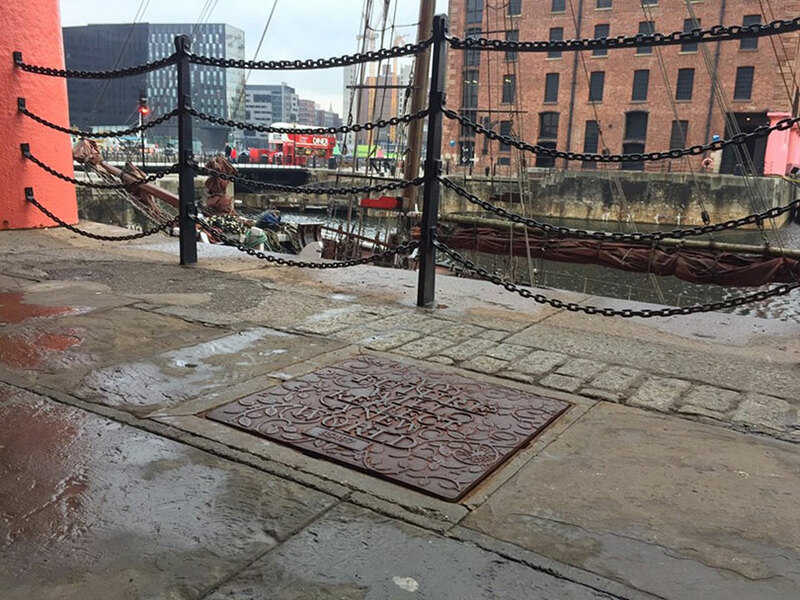 Liverpool's maritime history was central to Moon and Jeon's thinking when making these new works. A port city whose fortune was made in international trade, its first incoming cargo from the Americas was recorded in the mid-17th century. The industrial revolution brought exponential growth to Liverpool, but by the mid-20th century, its fortunes were in sharp decline. 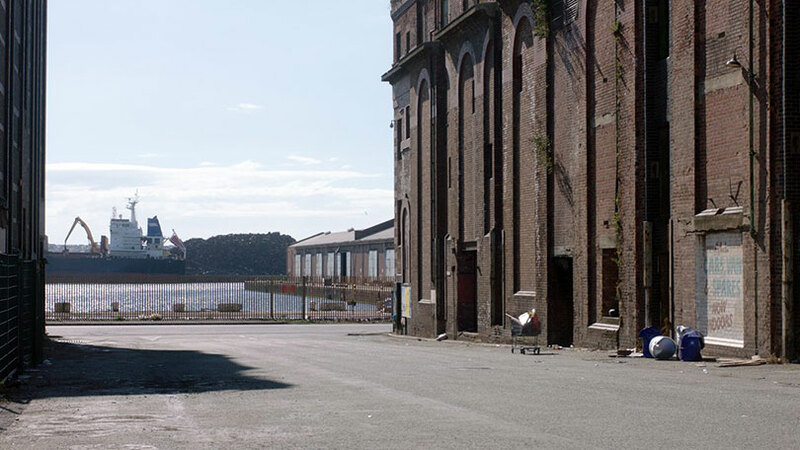 By the 1970s, the docks that had helped the city prosper (where Tate Liverpool is now situated), faced closure and eventually became derelict. This decline has much in common with Busan, Jeon's home city and South Korea's second largest, which grew in size and importance in the 1900s as a trading port for Japan. I'm giving you this brief history as these twin experiences are reflected in the installation and content of each of the two 〈Anomaly Strolls〉 films. If 2012's 〈El Fin del Mundo〉 uses the brief and intermittent collapsing of linear time and space to make its point (to great effect), the two separate parts of Anomaly Strolls, are much more abstract in tone. Instead of a clear narrative with central human characters, they rely and dwell on absence—of clear chronology, of visible people—to articulate, in contemplative fashion, what it means to exist today, while also reflecting on Liverpool and Busan's respective histories as port cities and, crucially, their post-industrial decline. Exhibition view: Moon Kyungwon and Jeon Joonho, 《News From Nowhere》, Tate Liverpool (23 November 2018 – 17 March 2019). Courtesy ©Tate. Photo: Oliver Cowling. The extremely quiet and hauntingly meditative 〈Anomaly Strolls I: Alchemy of Golden Leaf〉 leads the viewer through unpopulated streets. Life continues—in the blowing of blossom; plants thrive under artificial light; traffic lights still change; there is the ticking of a clock and the flickering to life of a television set—and yet, all this without evidence of a human presence. (In one clip, a cup of tea, steam still rising, is untouched.) There is a wonderful moment when the camera zooms, steady-cam-style, toward a photograph. A seascape: suddenly the waves begin to roil before our eyes. At the film's close, a lone motorcyclist, the first sign of humanity made flesh, seems to make their way out of town. Is this a last damning act of desertion? It's the very definition of a ghost town, one that makes for a sad but deeply beautiful evocation of what Moon referred to (at an artist talk at Tate Liverpool) as a 'certain absence'. 〈Anomaly Strolls II〉 tracks an invisible navigator from one of Liverpool's favourite local pubs, Peter Kavanagh's. An unseen hand pushes an empty pint glass across a table. Its owner could be that of the man from 〈El Fin del Mundo〉—outside the pub is a trolley and items that are seen in the earlier film. The trolley winds its way through ghostly, deserted streets; a lone ship comes into view as the action moves through docklands that were once bustling, though not today. This is intercut with footage of a mechanised loom; 'a metaphor', say the artists, 'for the weaving of time and space'—further evidence that our unseen actor could be an apparition or messenger from a coming apocalypse. Moon Kyungwon and Jeon Joonho, 〈Anomaly Strolls II〉 (2018). Single-channel HD film, 10 min 40 sec. Recycled metal, ©the artists and Gallery Hyundai. The trolley eventually comes to rest outside the gallery doors of Tate Liverpool, which is not without significance. While Busan and Liverpool each experienced the hardships wrought by post-industrial decline, the cities now find themselves enjoying respective regeneration. The former was added to the UNESCO Creative Cities Network in 2014 and has been dubbed 'Dynamic Busan, City of Tomorrow', and Liverpool's own cultural renaissance continues apace. The engine driving that renaissance is culture: 2018 marked the 30th anniversary of the opening of Tate Liverpool, an incredible shot in the arm for the then dilapidated dockland area. 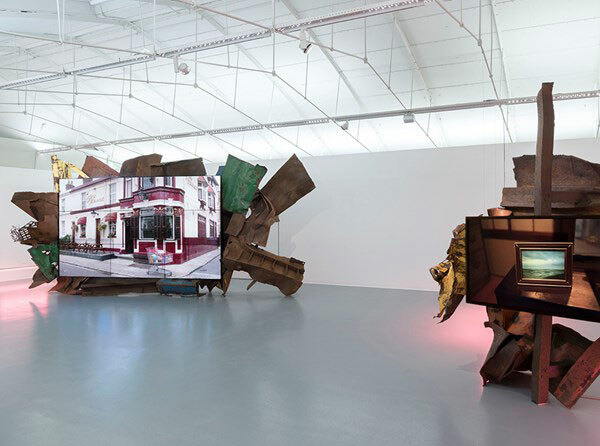 And it is no coincidence that subsequent years saw the city become home to 'the largest festival of contemporary visual art in the UK', with the 《Liverpool Biennial》's arrival in 1998. Ten years later, when Liverpool was designated the European Capital of Culture for 2008, the city's burgeoning regeneration was given yet another fillip. While it has not been easy, Liverpool has shed its image as a backwards-looking city, one whose culture revolved around its football clubs and the Beatles alone. 2018 is a far cry from the 1980s, when high unemployment existed alongside a sense of 'managed decline' in the city at the hands of Margaret Thatcher's Conservative government. At the time, tensions spilled over into riots in the city's Toxteth district—the result of then-perceived and now-acknowledged institutional racism among local police. It is worth noting that those dark days of unrest remain in living memory. ※ This article was originally published in OCULA(https://ocula.com) on 4 JAN 2019 and reposted under authority of a partnership between KAMS and OCULA.